Author and civic activist Jane Jacobs was involved in the efforts to preserve Washington Square Park and Pennsylvania Station. 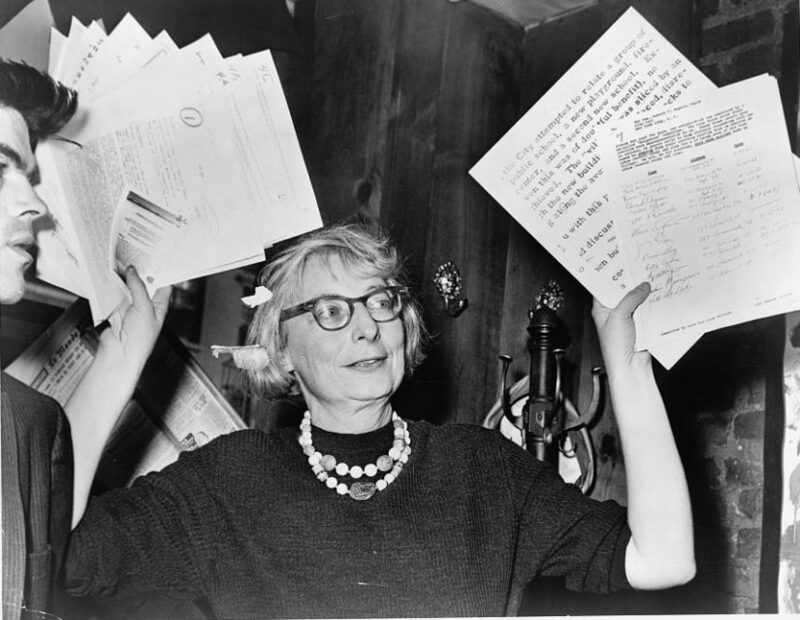 Jane Jacobs was an author, critic, and ardent civic activist.1 She was born Jane Butzner, on May 4, 1916 to Bess Robinson Butzner and John Decker Butzner, in Scranton, Pennsylvania. Her lifelong career as a writer began in 1934, when she started working at a Scranton newspaper, covering the women’s pages. In 1938, Jacobs moved to New York City and attended Columbia University’s School of General Studies for two years. She took courses in geology, zoology, law, political science, and economics. In 1944, she married Robert Hyde Jacobs, an architect, and they had three children. In 1952, Jacobs accepted a position as the associate editor of Architectural Forum. Jacobs’s expertise was in the subject of school and hospital buildings. She eventually went on to cover stories about architectural planning and rebuilding. In 1958, Jane Jacobs wrote an article for a series that ran in Fortune Magazine entitled, “The Exploding Metropolis.” Her piece gained the attention of the Rockefeller Foundation, which then requested that she continue her writings about the American City. "Jacobs has probably bludgeoned more old songs, rallied more support, fought harder, caused more trouble, and made more enemies than any other American woman since Margaret Sanger." Oral Histories with Bronson Binger, Anthony Dapolito, Diana Goldstein, Carol Greitzer, and Whitney North Seymour, Jr.
Anthony C. Wood, Preserving New York: Winning the Right to Protect A City’s Landmarks (New York: Routledge, 2008), page 184. Martin Douglas, “Jane Jacobs, Urban Activist is Dead at 89,” The New York Times, 25 April 2006. Anthony C. Wood, Preserving New York: Winning the Right to Protect A City’s Landmarks (New York: Routledge, 2008), page 298.